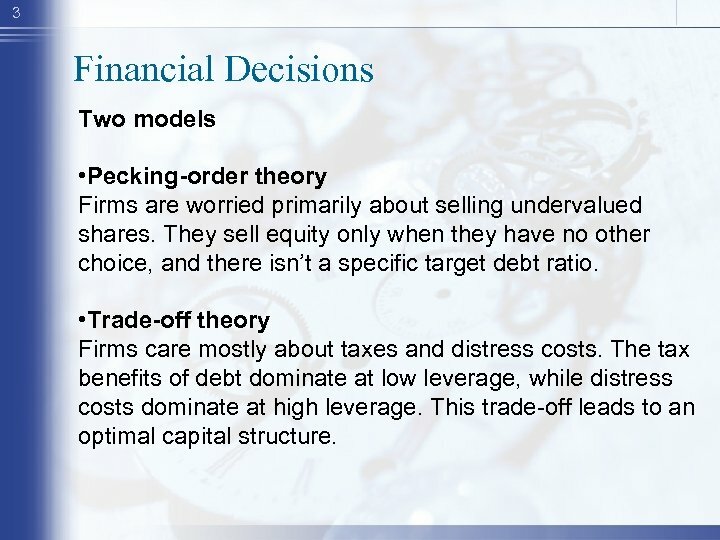 3 Financial Decisions Two models • Pecking-order theory Firms are worried primarily about selling undervalued shares. 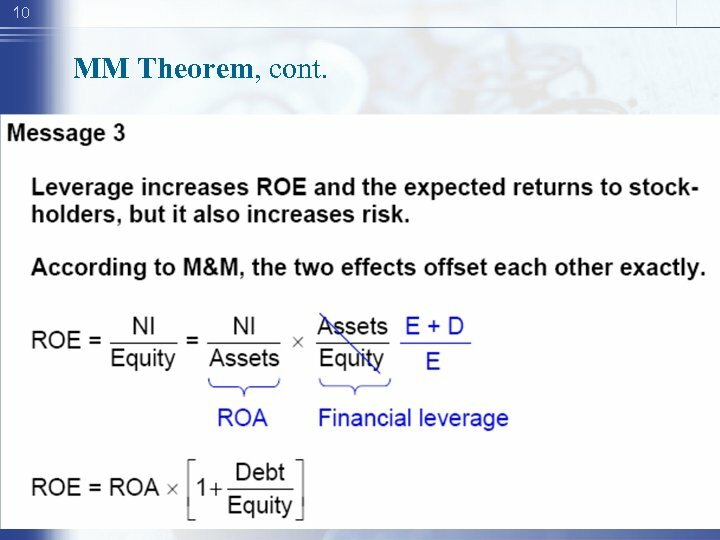 They sell equity only when they have no other choice, and there isn’t a specific target debt ratio. • Trade-off theory Firms care mostly about taxes and distress costs. 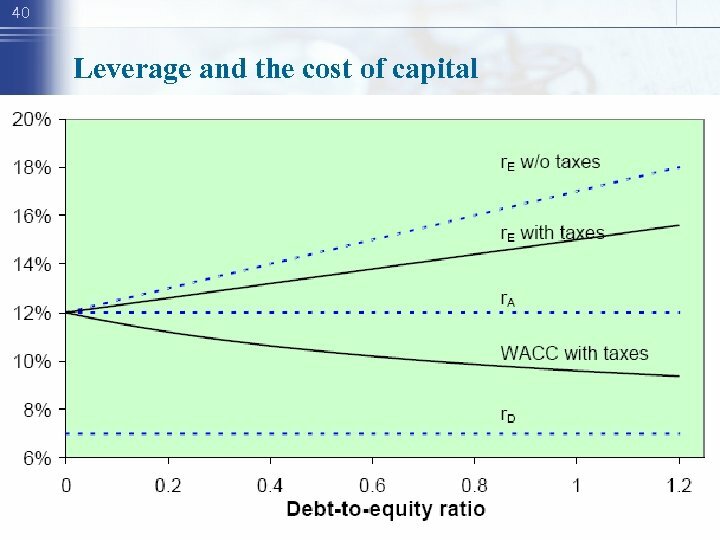 The tax benefits of debt dominate at low leverage, while distress costs dominate at high leverage. 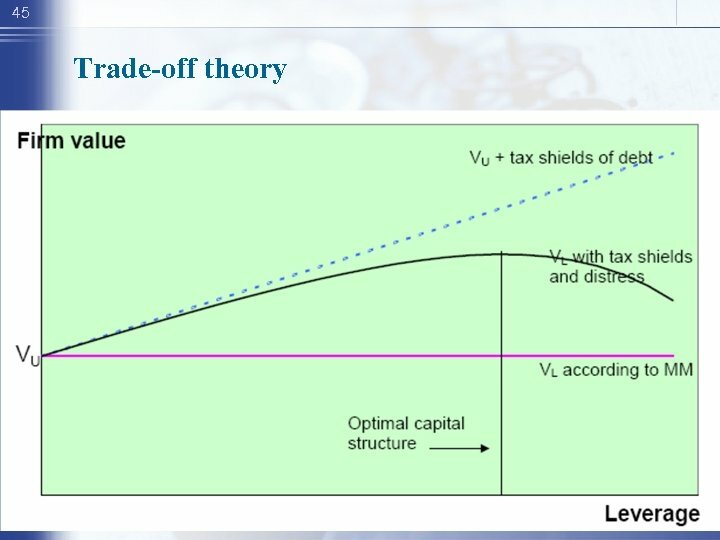 This trade-off leads to an optimal capital structure. 8 MM Theorem, cont. 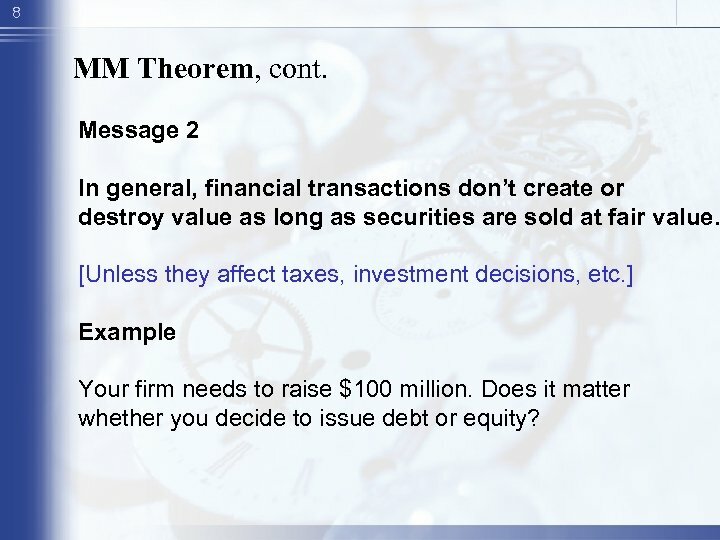 Message 2 In general, financial transactions don’t create or destroy value as long as securities are sold at fair value. 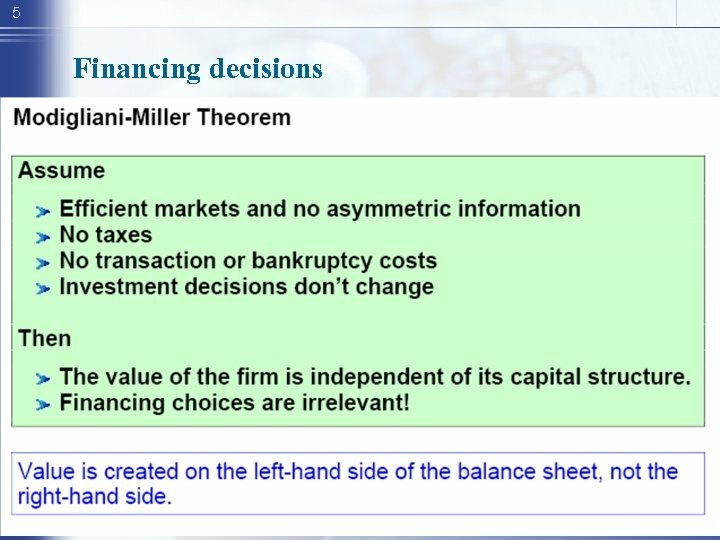 [Unless they affect taxes, investment decisions, etc. ] 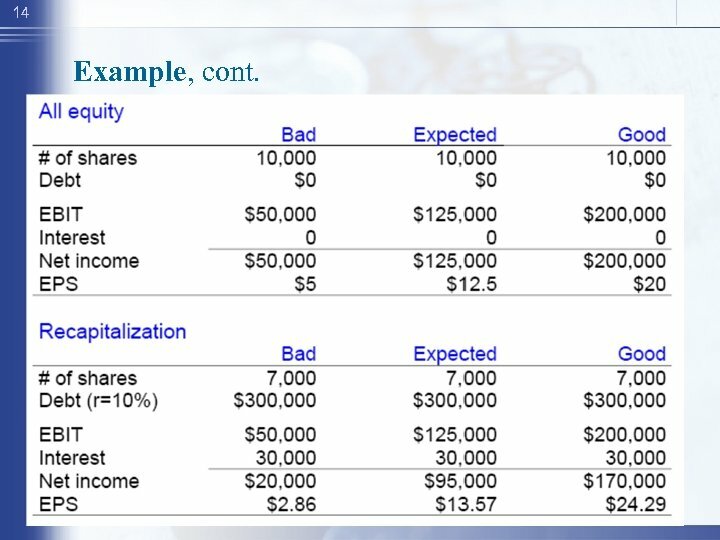 Example Your firm needs to raise $100 million. 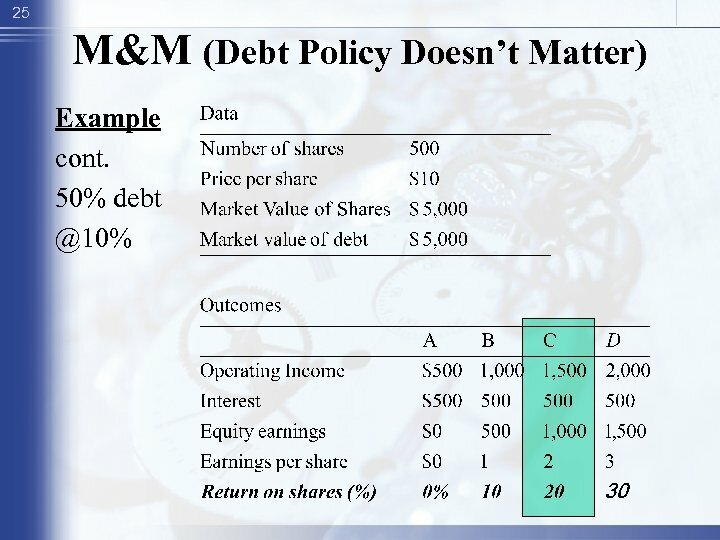 Does it matter whether you decide to issue debt or equity? 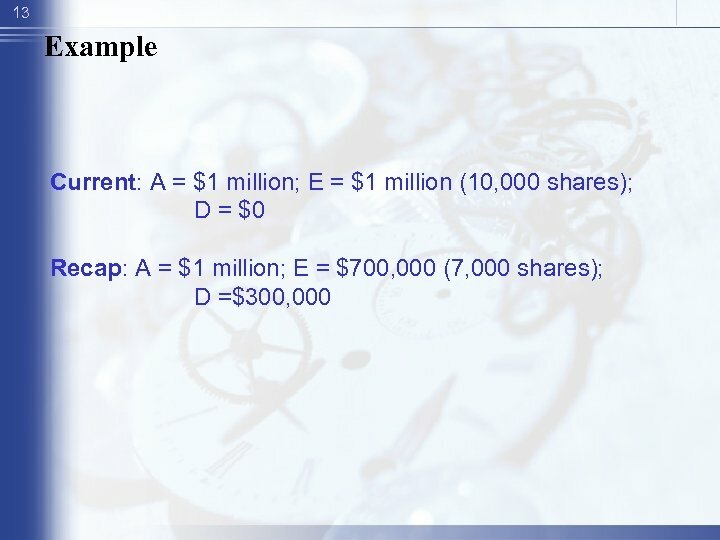 12 Example Your firm is all equity financed and has $1 million of assets and 10, 000 shares of stock (stock price = $100). 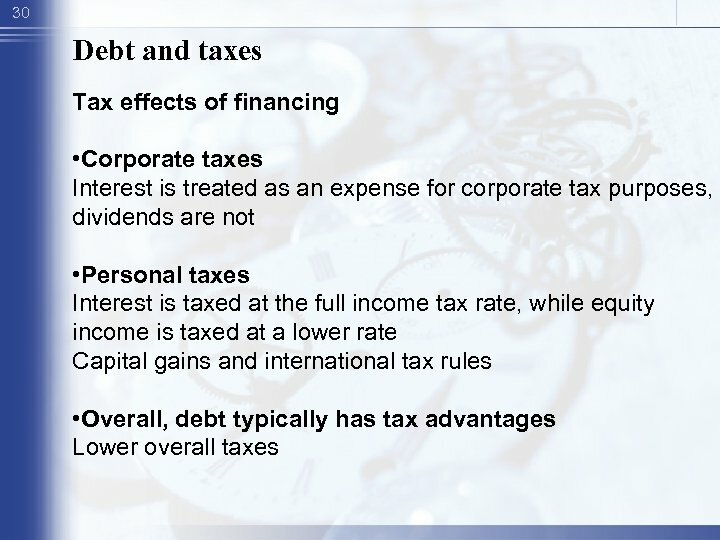 Earnings before interest and taxes next year will be either $50, 000, $125, 000, or $200, 000 depending on economic conditions. 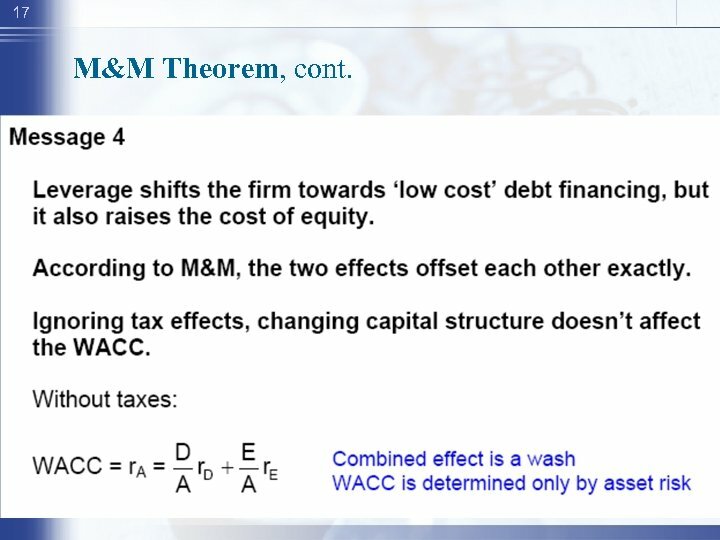 The firm is thinking about a leverage recapitalization, selling $300, 000 of debt and using the proceeds to repurchase stock. 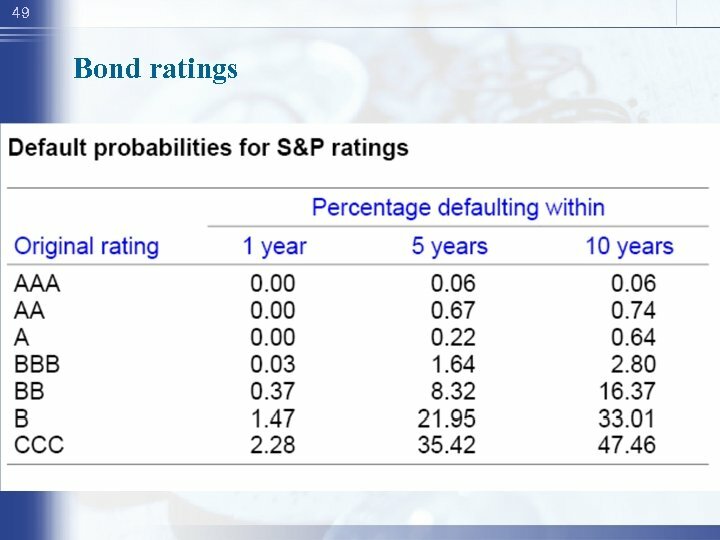 The interest rate is 10%. 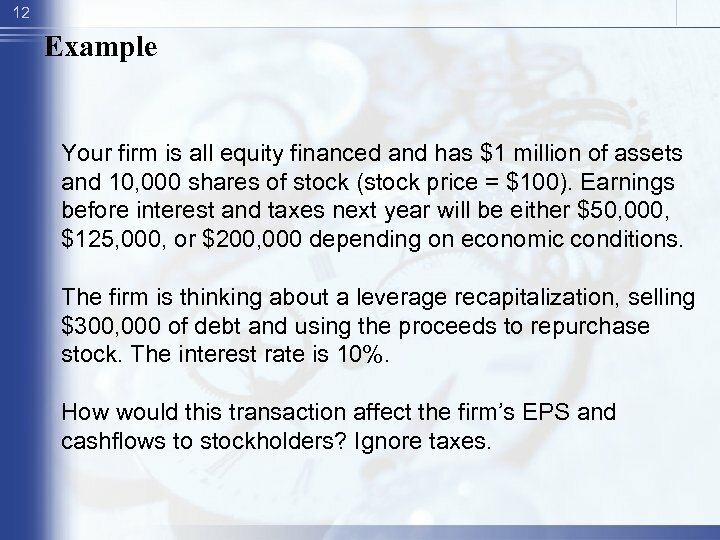 How would this transaction affect the firm’s EPS and cashflows to stockholders? 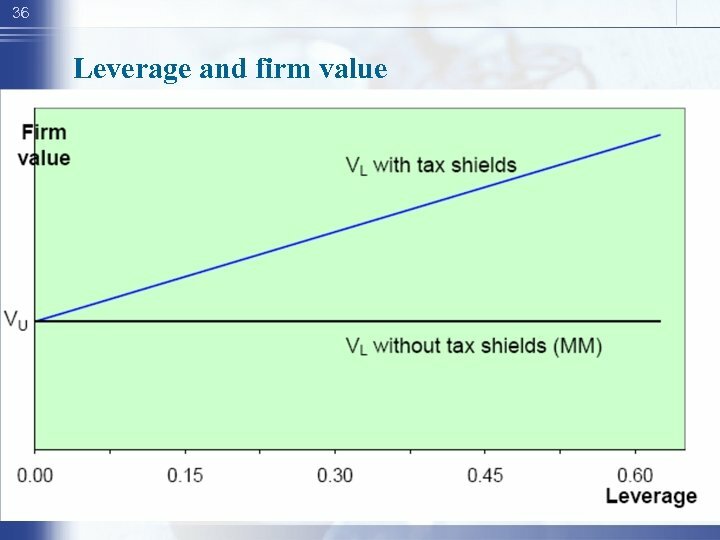 Ignore taxes. 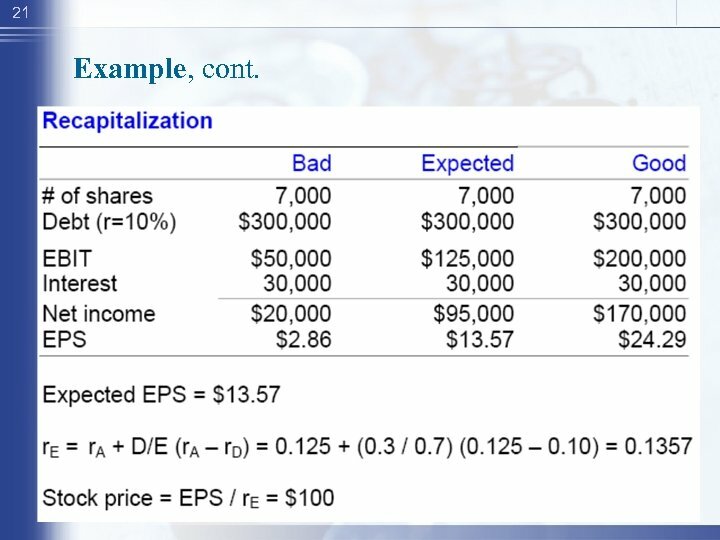 18 Example Your firm is all equity financed and has $1 million of assets and 10, 000 shares of stock (stock price = $100). 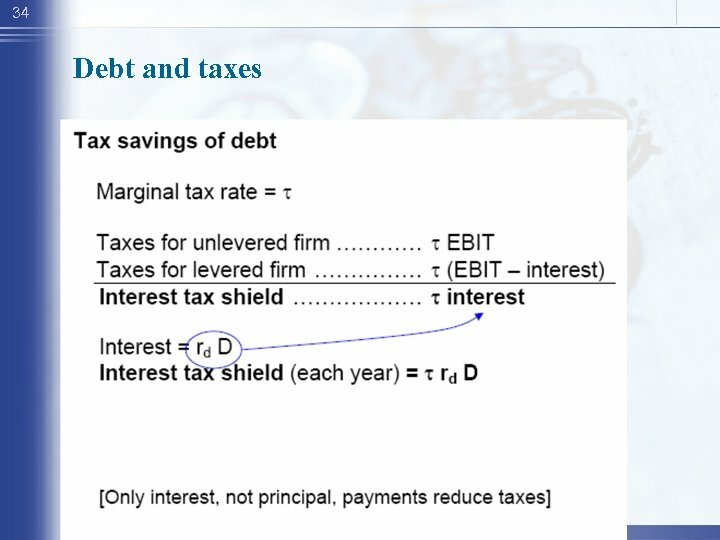 Earnings before interest and taxes next year will be either $50, 000, $125, 000, or $200, 000. 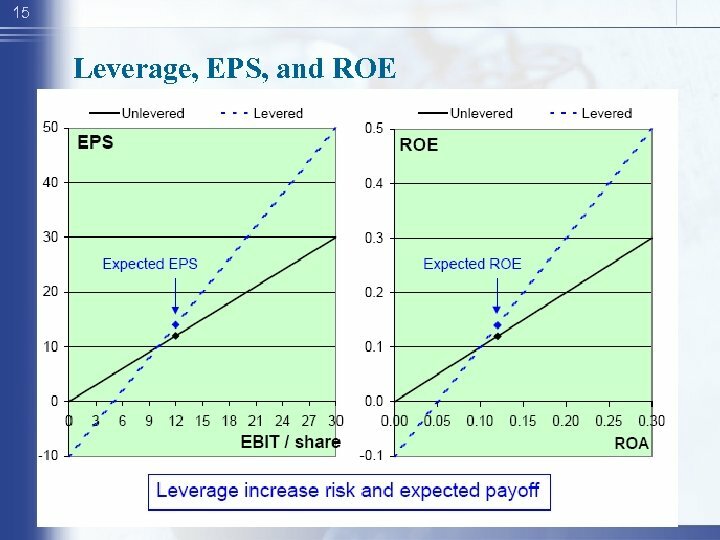 These earnings are expected to continue indefinitely. 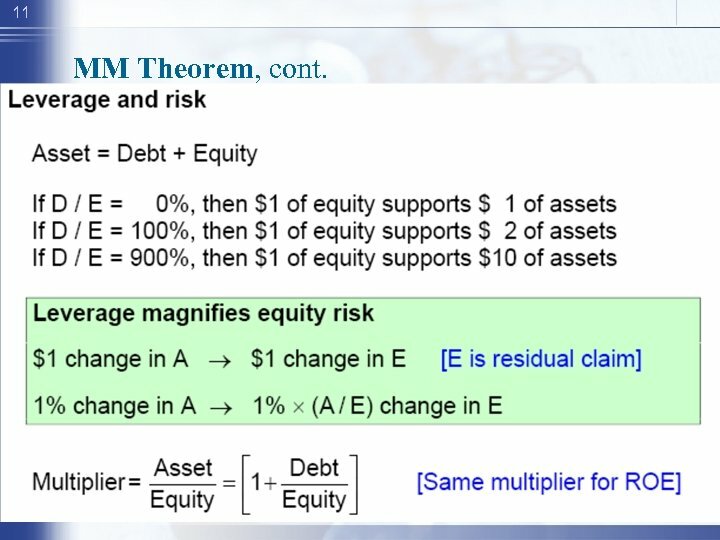 The payout ratio is 100%. 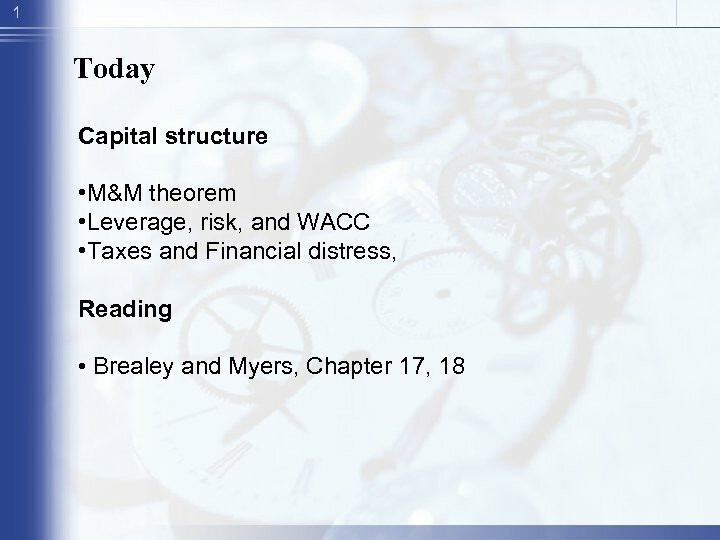 The firm is thinking about a leverage recapitalization, selling $300, 000 of debt and using the proceeds to repurchase stock. 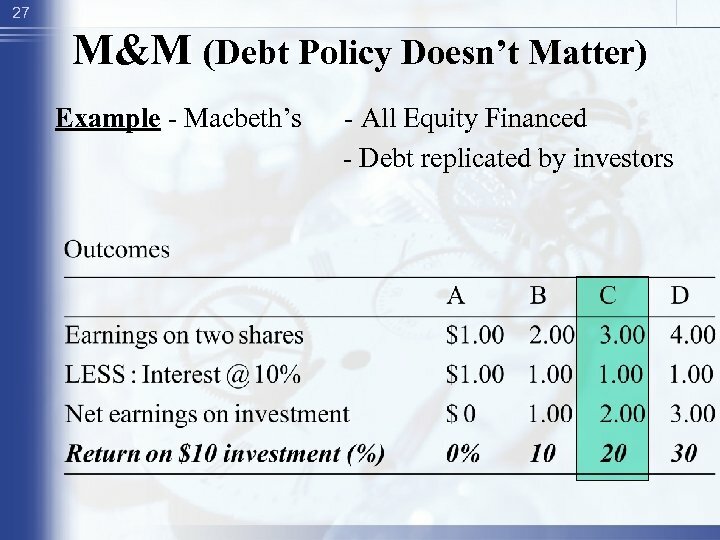 The interest rate is 10%. 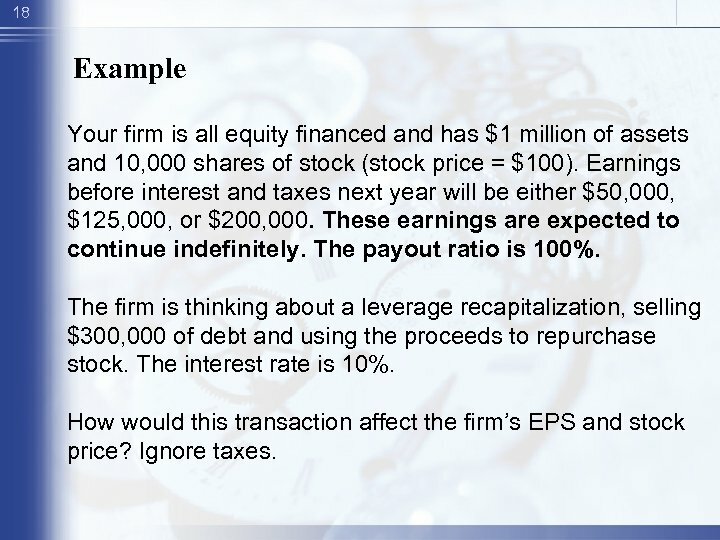 How would this transaction affect the firm’s EPS and stock price? Ignore taxes. 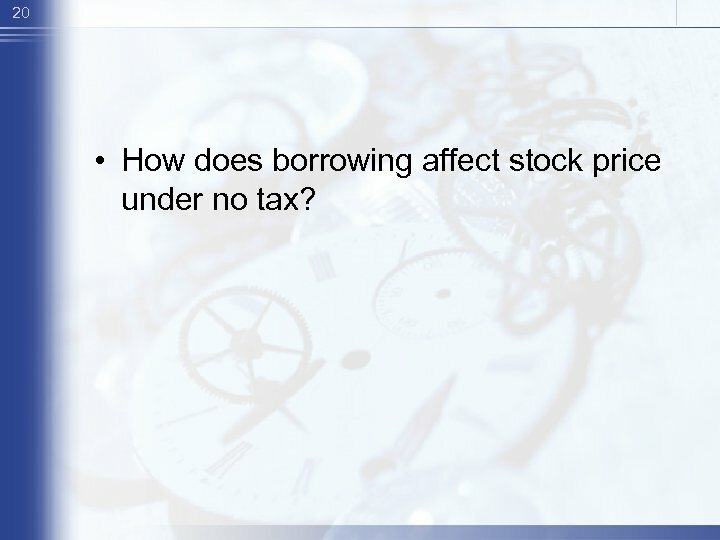 20 • How does borrowing affect stock price under no tax? 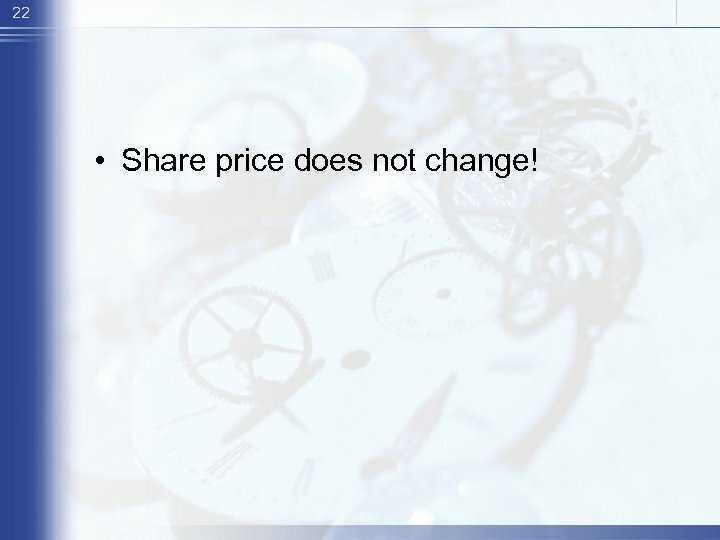 22 • Share price does not change! 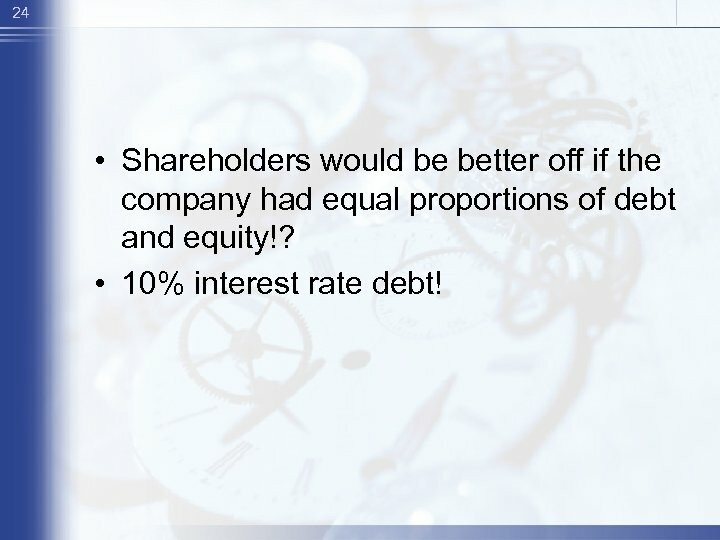 24 • Shareholders would be better off if the company had equal proportions of debt and equity!? 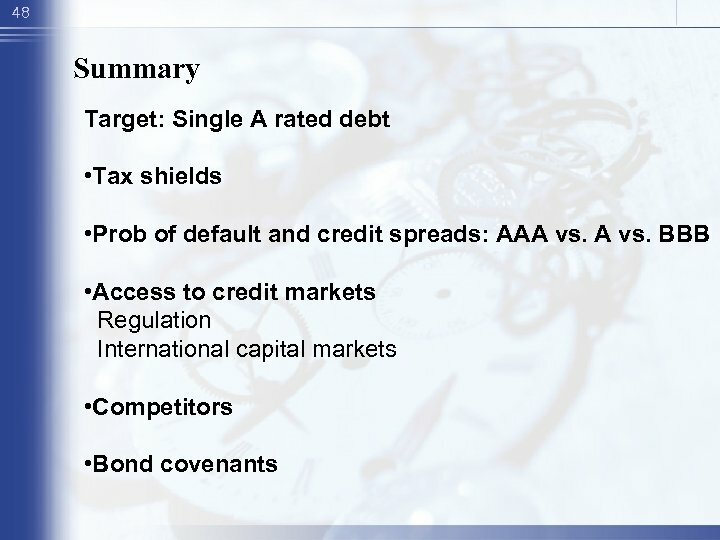 • 10% interest rate debt! 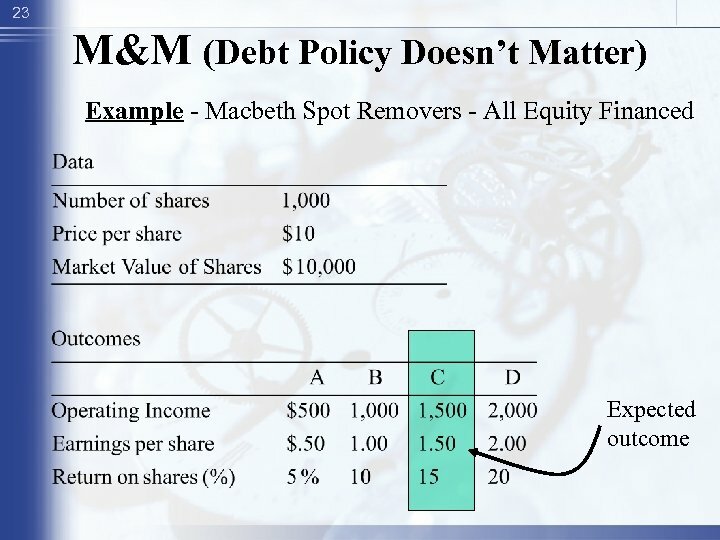 26 M&M (Debt Policy Doesn’t Matter) Leverage increase return on equity! 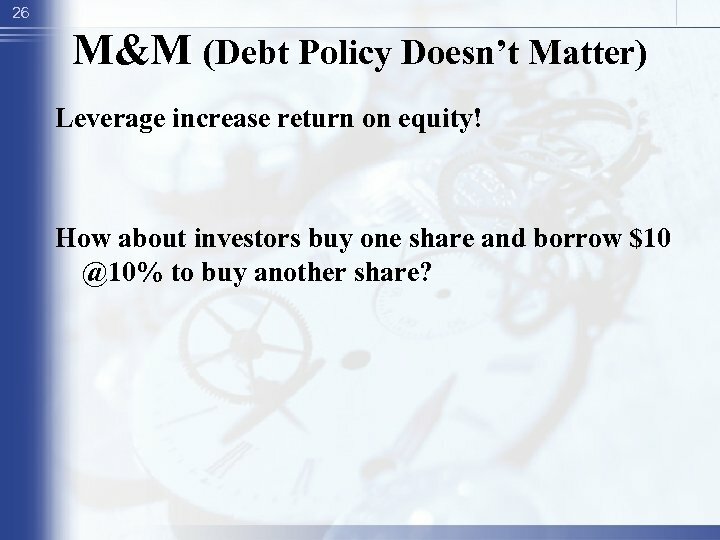 How about investors buy one share and borrow $10 @10% to buy another share? 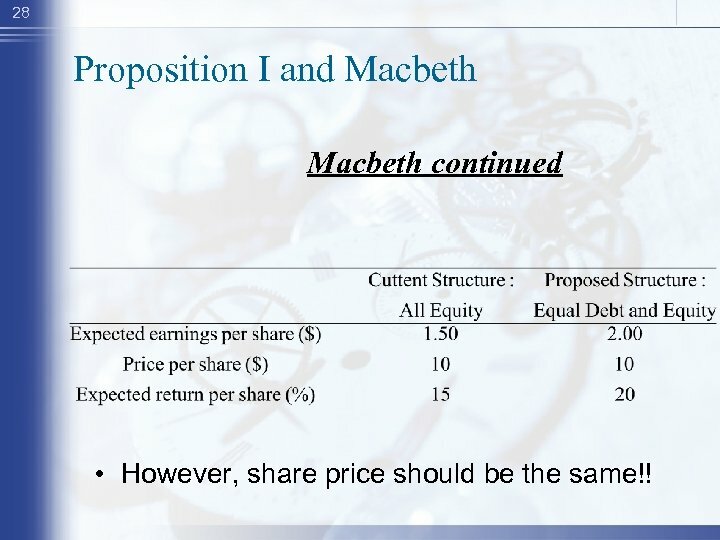 28 Proposition I and Macbeth continued • However, share price should be the same!! 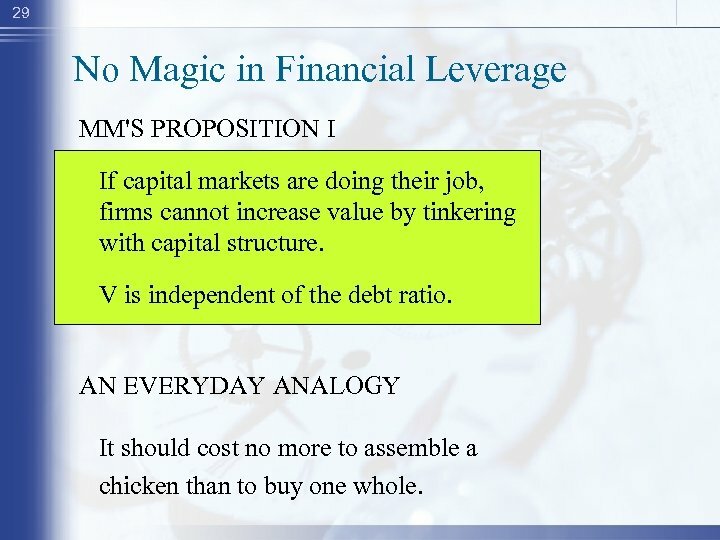 29 No Magic in Financial Leverage MM'S PROPOSITION I If capital markets are doing their job, firms cannot increase value by tinkering with capital structure. 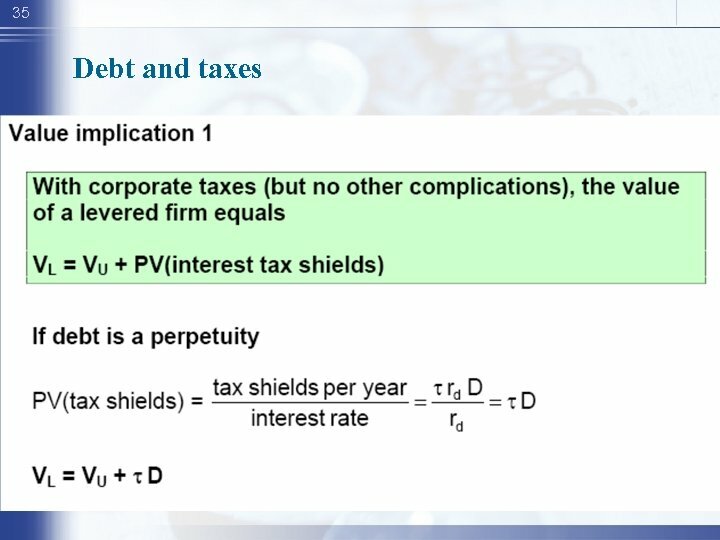 V is independent of the debt ratio. AN EVERYDAY ANALOGY It should cost no more to assemble a chicken than to buy one whole. 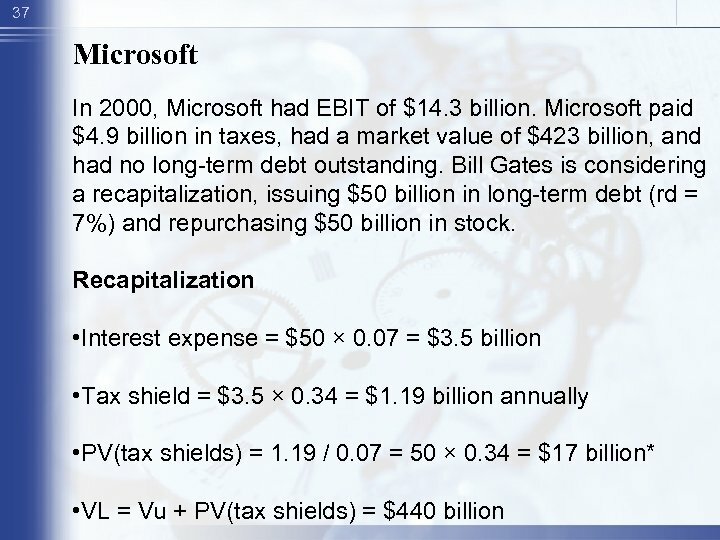 31 Example In 2000, Microsoft had sales of $23 billion, earnings before taxes of $14. 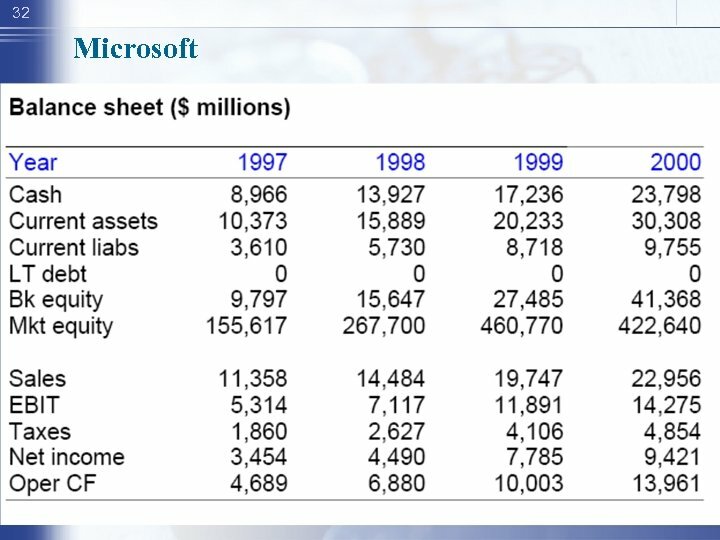 3 billion, and net income of $9. 4 billion. 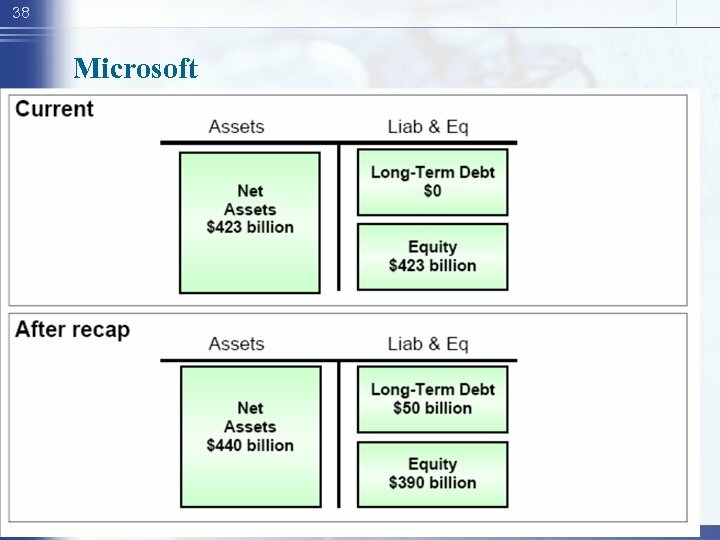 Microsoft paid $4. 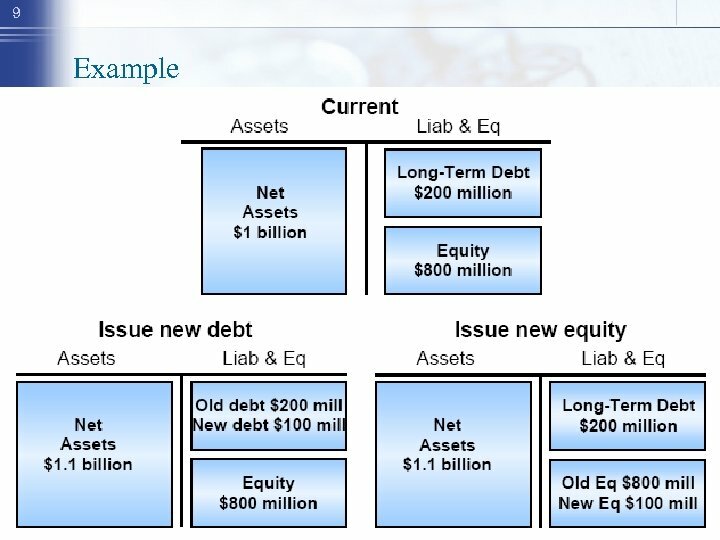 9 billion in taxes, had a market value of $423 billion, and had no long-term debt outstanding. 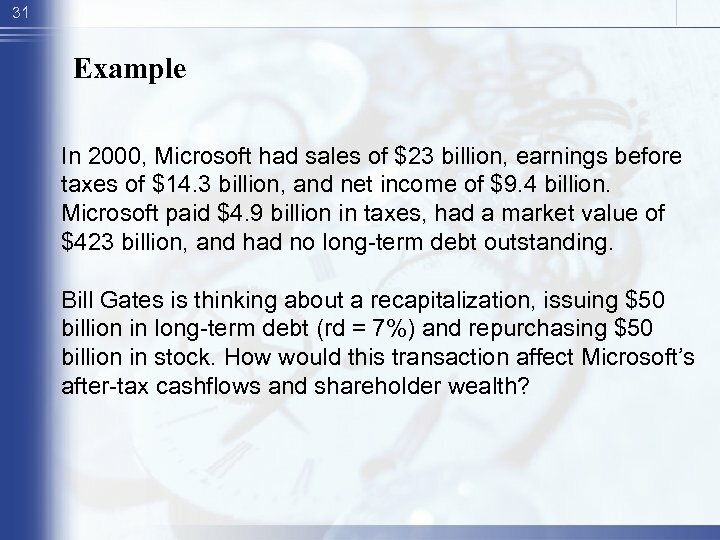 Bill Gates is thinking about a recapitalization, issuing $50 billion in long-term debt (rd = 7%) and repurchasing $50 billion in stock. 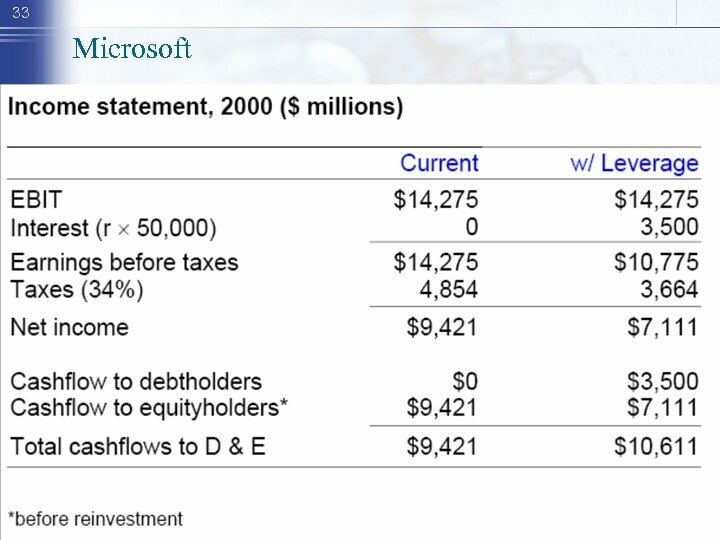 How would this transaction affect Microsoft’s after-tax cashflows and shareholder wealth? 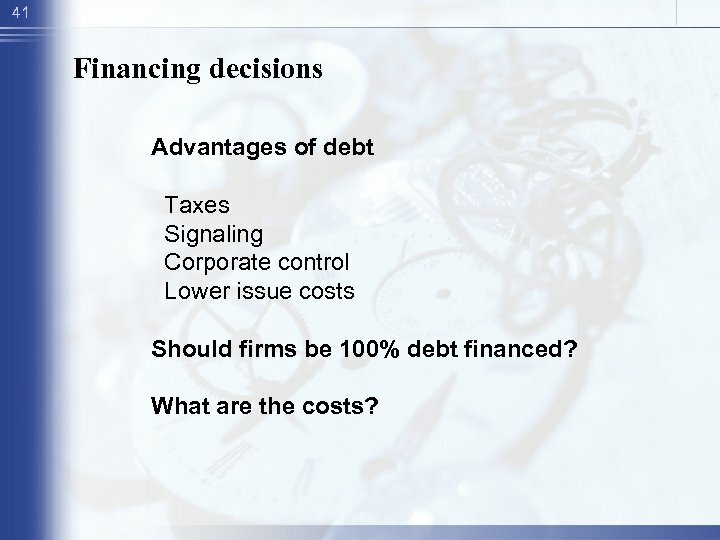 41 Financing decisions Advantages of debt Taxes Signaling Corporate control Lower issue costs Should firms be 100% debt financed? 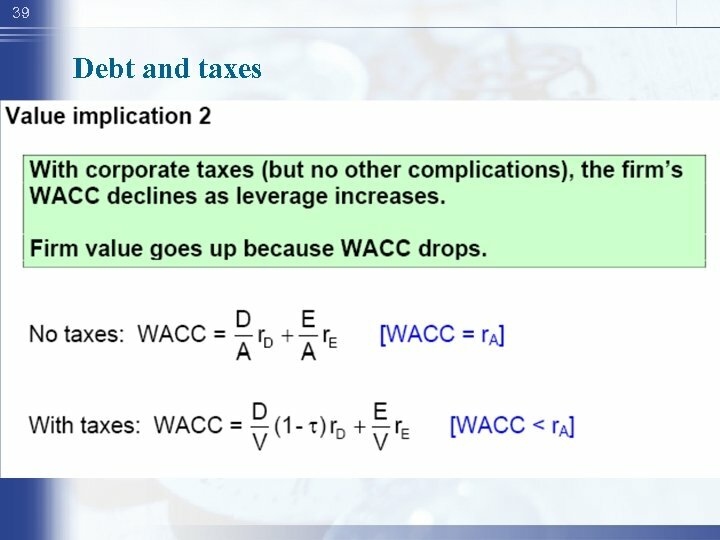 What are the costs? 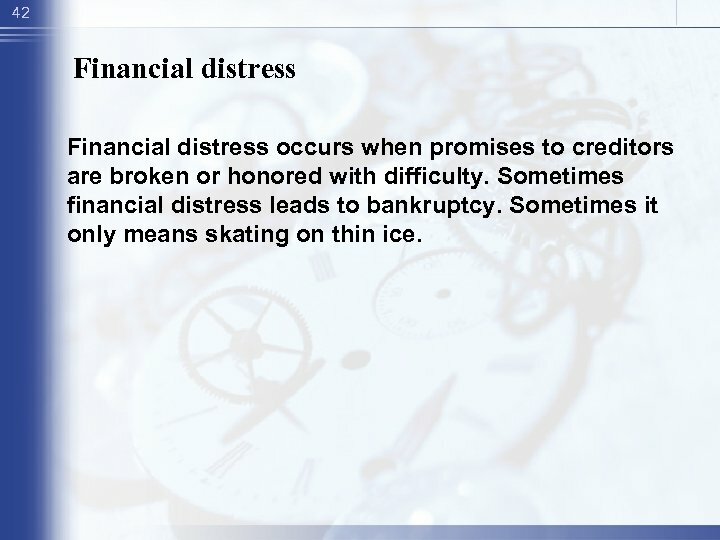 42 Financial distress occurs when promises to creditors are broken or honored with difficulty. 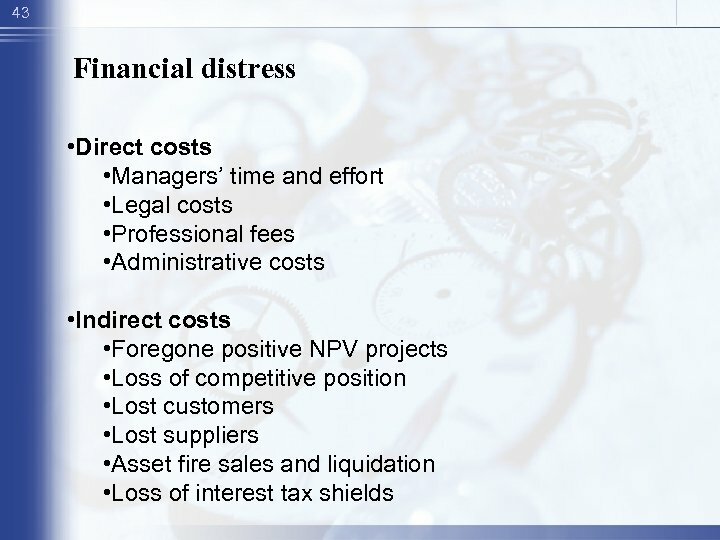 Sometimes financial distress leads to bankruptcy. Sometimes it only means skating on thin ice. 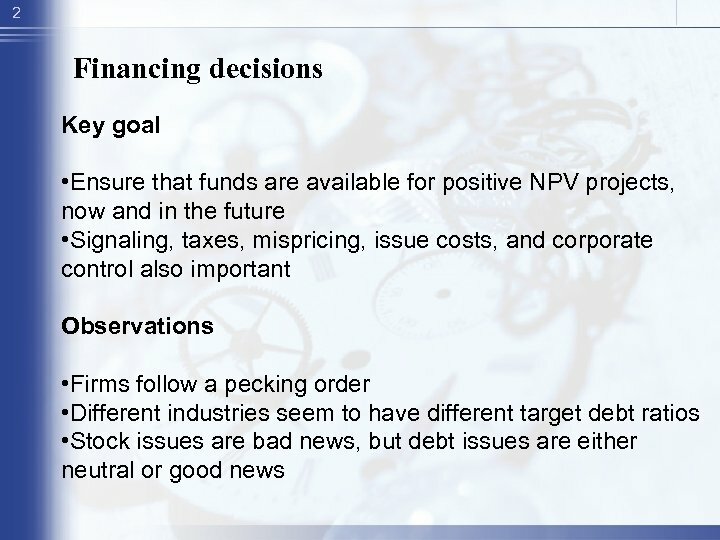 46 Summary Financing checklist • Taxes Does the firm benefit from interest tax shields? 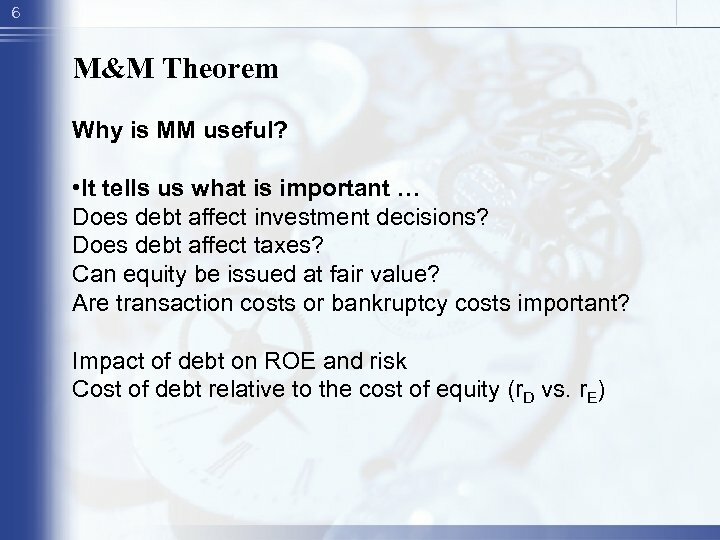 • Signaling and mispricing Is our equity fairly valued? 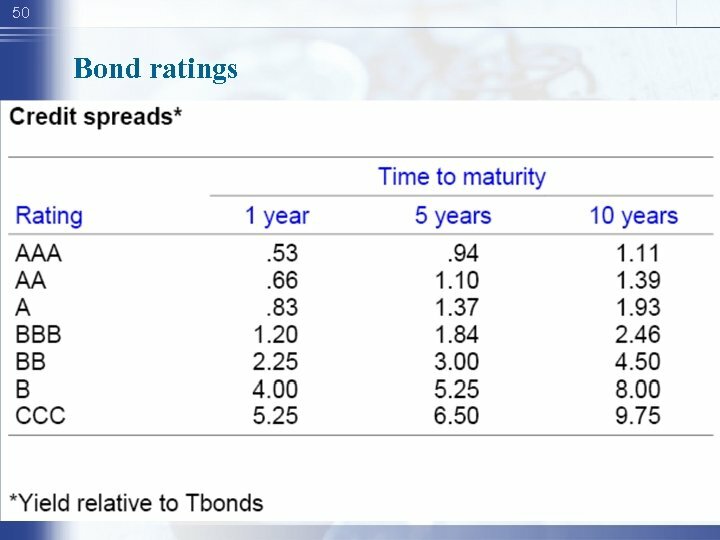 How will investor react? 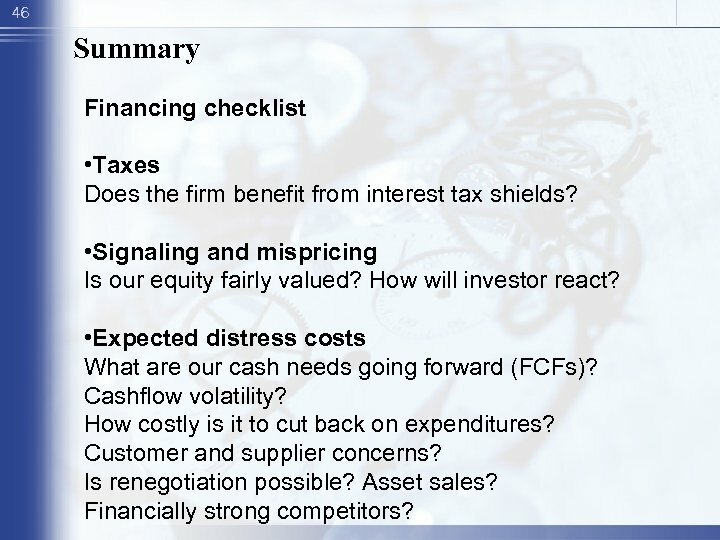 • Expected distress costs What are our cash needs going forward (FCFs)? 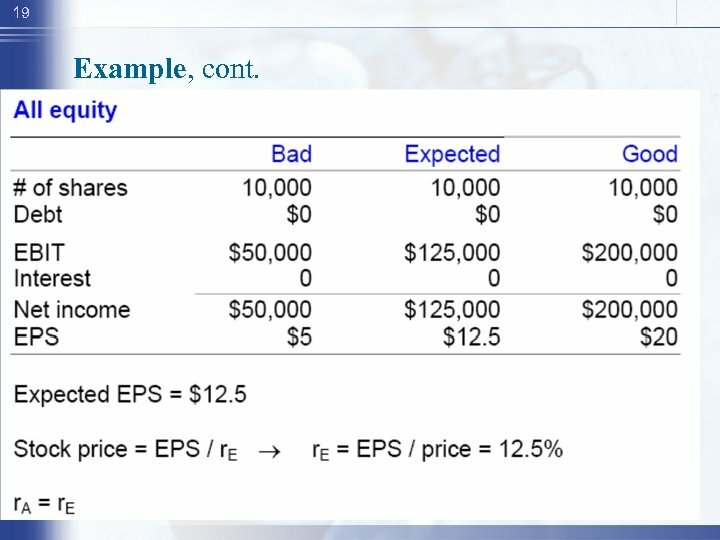 Cashflow volatility? 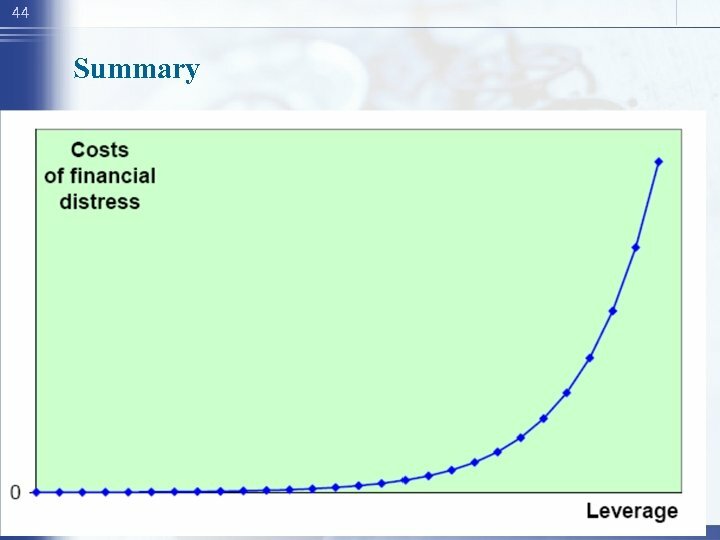 How costly is it to cut back on expenditures? Customer and supplier concerns? Is renegotiation possible? 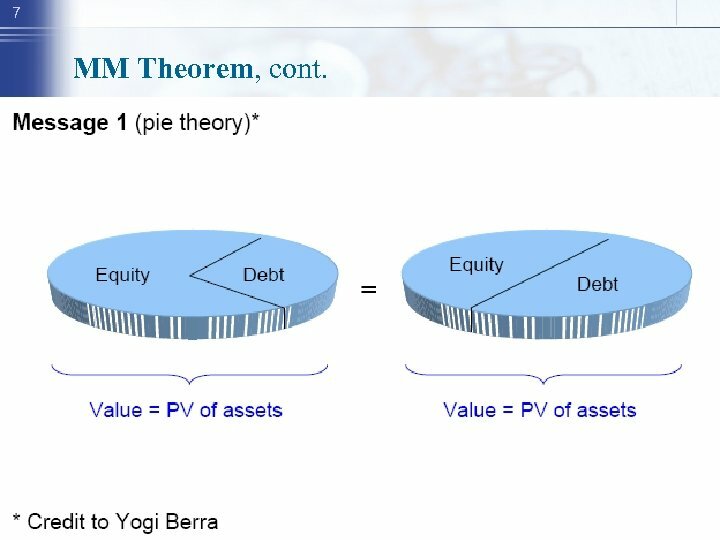 Asset sales? 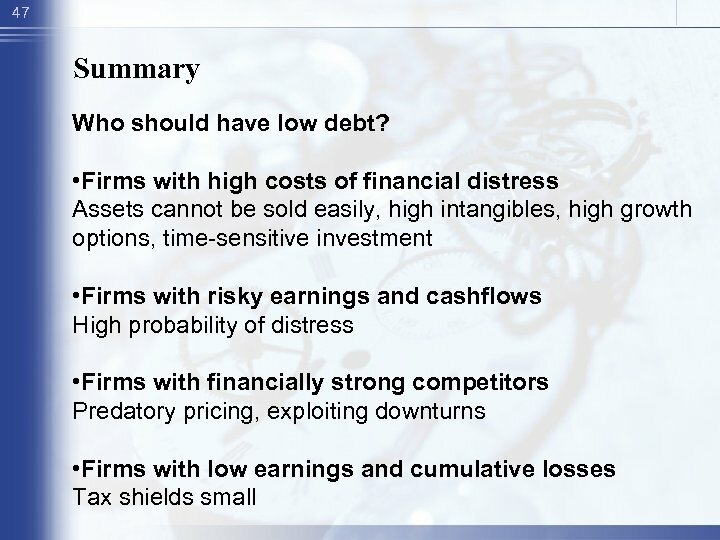 Financially strong competitors?